Want to shop for fresh organic veggies and fruits but too lazy to go to the supermarket or the occasional farmer’s market? Not to worry-Green Little Frog delivers seasonal vegetables and fruits grown in Northern Thailand right to the comfort of your home in Hong Kong. Packed and delivered within 36 hours of being harvested, we knew we were getting the freshest in seasonal produce when we got the delivery in a cute reusable shopping bag. 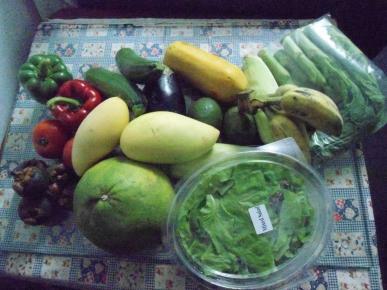 Inside were the fresh goodies, with the majority being fruits, including: bananas, avocados, mangoes, red and green bell peppers, mangosteen, pomelo, gai lan, zucchini, lettuce, eggplant, cherry tomatoes, and papaya. You only get what is seasonal, so it’s a great surprise to open a bag up each time to find something slightly different (not that you can get bored with these colourful items!) Armed with all sorts of items, we were inspired to dig right in to enjoy a fresh fruit salad. Green Little Frog sells a 3-4kg bag of mixed veggies and fruits for HKD 320-350, HKD 550-600 for a 6-7kg bag and HKD 430-450 for a 4kg tropical fruit bag.